Derived from the great indian scriptures of Dhanurveda, kalarippayatt is said to be the mother of all asian martial arts and is still nowadays taught traditionnally in its home land of Kerala, a state of south India. 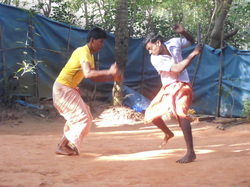 The term of kalarippayatt designates the particular martial training taking place inside a kalari or place of military practice. A kalari is a very unique kind of building with specific and symbolic architecture. Considered a temple in its own right, it holds different deities, the main one (Shiva-Shakti) being represented in the South-West corner where the puttara stands, a shrine for flower offerings and daily worship. Each kalari is run by a Gurukkal who is not only a master of martial arts, but also a healer, expert in kalarichikitsa – a theraputic system based on a knowledge of the body’s vital spots, or marmas. There is a growing Kalari-scene in Kovalam. But watch out, some offers are highly commercial and only made up for western curiosity. The kalari practice group which is seen in the video clip above is an authentic, locally based association, headed by Kalari-master Babu Asan. Contact to this group can be made through Muringa Vila, please ask if you are interested.